Once your library is organized, you must train your students how to use it! Each child has a book box. This is where they store the books they have chosen to read for the week. They use this box when it is time for Stamina Reading. During this time, students take their book box to a quiet, cozy space in the room and they read independently for a certain amount of time (set by me--depending on grade and time of year). When Stamina Reading is over, students do not change books. They put the book box back in the rack and the next time we do Stamina Reading, they continue reading the same books. After a few days to a week (depending on the number of books and/or the grade level), we "Go Shopping!" During this time, students put the old books back and they get to choose new books! Before I allow students to begin, we practice the correct way to return books. I let a few students model how to do it and then I call kids gradually to put their books AWAY--do not choose new books yet! Once all the kids are back at their seats with empty book boxes, then I set the guidelines for choosing new books. At the beginning of the year, I keep it simple (Ex: choose 2 fiction, 1 author and 1 non-fiction). Later in the year though, I might set guidelines based on specific skills (Ex: non-fiction, author, language, etc). Once all the students have chosen their books, we do a check. Students hold up books based on specific genres that I call out. In this way, I can quickly see what students have and, on the spot, I can send them for harder/easier books, fiction/non-fiction or language depending on what each student needs. **I usually limit the number of books in the book box from 3-7 books total and, if it doesn't fit, it can't go in the box. Sometimes students will say "I'm done!" after a few minutes of reading. For those students, we look at the books together--it is usually a sign that they weren't reading or they chose books that were too easy/hard. Guide those students to make better choices for next time. Sometimes students can't find the box they are looking for! Or they run out of time and can't put their books in the right place! My solution is the "Find My Home" box. 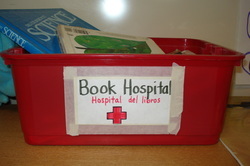 This box is where students can place books with hard-to-find boxes. As the box fills up, I ask student helpers to file the books in the correct place when they have time. This is a good job for kids who finish work early or for kids who love to help! From the beginning I talk about taking care of our library--it is OUR library and we want it to be a nice place to find great books. However, some books are really popular and get read so often that they fall apart. Other times, accidents happen and a book gets ripped. When a book needs to go to the "Hospital," they place the book in the box so that I can fix it. When I have time, I tape it or edit it--whatever the book needs. Then I place it back in the "Find My Home" Box for someone to file in the correct place. After a few weeks of students choosing and replacing books, it can get a little messy. When I see that books are not being placed correctly or that they are not put in the boxes in a respectful way, then we have a meeting and we talk about Library Procedures. If the library is only slightly disorganized, I might choose a few students to go through and straighten it up, but sometimes the library needs an overhaul! During this time, students empty their book boxes of all books and put them back into the library. Then everyone helps to organize the books. Each kid grabs a box and looks for books that are misplaced, upside down, backwards, books from the SCHOOL library, broken books, books from other libraries--basically we go through and clean it out! Once the box is clean and organized it goes back on the shelf and they grab another one. We do this until all the books are back in order. 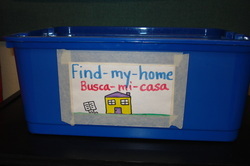 Usually at the end, the "Find My Home" box is full, but students will solve that problem later. By everyone working together, students take pride and ownership in their library and the teacher does not have to do it all herself! !